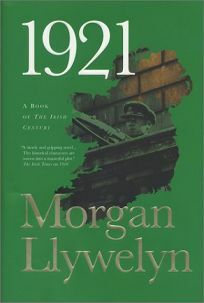 Llywelyn's second novel in the series she inaugurated with 1916 (1998) furthers her investigation of Irish history by focusing on Ireland's struggle for freedom from Britain. This volume begins in 1917 in the aftermath of the Easter Rising and carries through to the civil war and the establishment of the Republic of Ireland. That Llywelyn knows her Irish history, culture, language and ambience is unquestionable. Unfortunately, in her attempt to amalgamate her encyclopedic knowledge of Ireland with the fictional adventures of Henry Mooney, a journalist torn between the traditional demands of family and personal ambition and his commitment to his country, she produces a story that is as dense as an Irish bog and nearly as confusing to navigate. Henry, a supporter of the Republican cause but a political moderate and neutral observer by nature, moves with alacrity among the various factions, apparently enjoying journalistic immunity as he uses his pen to further the Irish cause and attack the British. As the situation in the country deteriorates, Henry's personal life becomes more complex. Smitten with passionate S le Halloran, but unable to possess her since she is the wife of his best friend and Easter veteran Ned (protagonist of 1916), Henry falls in love with beautiful Anglo-Irish siren Ella Rutledge, further dividing his loyalties. Often sliding into essayistic prose, with footnotes supplementing the text, the novel depicts events and political developments in exhaustive detail. Though the account of the civil war is thorough and nuanced, readers of 1916 and other popular books by Llywelyn (Lion of Ireland; Bard, etc.) may be taken aback by the historical heft of this offering. (Mar.) Forecasts: Llywelyn is a popular writer and this book won't hurt her sales record, boosted as it will be by an excerpt in the mass market edition of The Last Prince of Ireland (due out March 1), an eight-city author tour, national ad/promo and the availability of a reading group guide (the book is caboosed by 17 pages of source notes and bibliography).